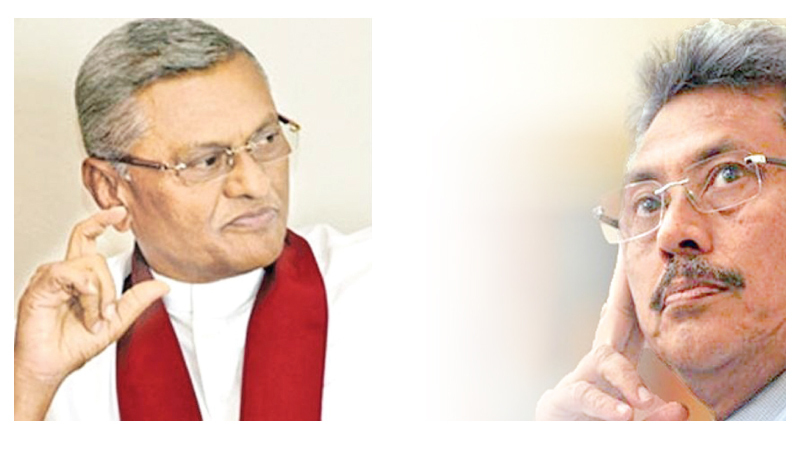 Chaos has erupted in the Sri Lanka Podujana Peramuna (SLPP) as two of the Rajapaksa brothers, former Defence Secretary Gotabaya Rajapaksa and former Speaker Chamal Rajapaksa have both signalled their potential candidacy for the upcoming Presidential elections. Elections are expected to take place before January 7 2020, when President Maithripala Sirisena concludes his first term in that office. Last Saturday, Gotabaya Rajapaksa shocked the SLPP hierarchy by declaring to an assembly of his Viyath Maga professional organisation that he was ready to contest the upcoming Presidential elections, following his declaration with a detailed outline of his vision for a Sri Lanka where people rose above ethnic and religious differences joining together as one. The news stunned senior SLPP leaders such as Kumar Welgama and Vasudeva Nanayakkara who were not privy to this announcement beforehand, and who have openly lobbied that a democratic candidate be put forward by the SLPP. The Viyath Maga organization on Tuesday followed up Rajapaksa’s announcement by releasing a video on social media platforms declaring Gotabaya Rajapaksa’s candidacy for “2020”. Several SLPP leaders are opposed to a candidacy by Gotabaya Rajapaksa, citing his US citizenship and controversy over his alleged role in various incidents under investigation by the CID, FCID and Bribery Commission, including the ‘Mig Deal’, Lasantha Wickrematunge murder, Keith Noyahr abduction and the Avant Garde affair. The Bribery Commission last year charged Gotabaya Rajapaksa, Nissanka Senadhipathi and others with corruption to the tune of Rs 11.4 billion in connection with the operation of a floating armory by Avant Garde Maritime Services. Podujana Peramuna heavyweights have appealed to their party’s de-facto leader, former President Mahinda Rajapaksa, to nominate a presidential candidate who is not mired in concerns about criminal cases and foreign citizenship. Ampara MP Wimalaweera Dissanayake stated yesterday that it was Basil Rajapaksa who is the architect of the SLPP, its iconic ‘Pohottuwa’ symbol, and electoral strategy, and that MPs aligned with the SLPP believe that Basil Rajapaksa is the only viable candidate for their party at the upcoming presidential elections. However, Basil Rajapaksa is under indictment in two separate cases in the High Court. He is charged with misappropriating Rs. 3 billion in Divi Neguma funds for the 2015 presidential election campaign. The case is coming up for trial on 15th March 2019. He has also been indicted for money laundering in connection with the construction of a mansion for his family in Malwana. The fate of these cases make the former MP less of a viable candidate in the eyes of many of the SLPP rank-and-file. A possible candidacy by Chamal Rajapaksa was mooted on several occasions by several Pohottuwa figures, as the former Speaker has never been tainted by criminal investigations. He is also a Sri Lankan citizen with no foreign affiliations.Chamal Rajapaksa also played a key role as Speaker in the passage of the 19th Amendment through Parliament. Chamal Rajapaksa yesterday told the Daily News that he is a contender for the presidential nomination of the SLPP. According to a senior leader of the SLPP, the former Speaker made this announcement with the blessing of certain senior members of the party hierarchy to send a signal to the former Defence Secretary and Basil Rajapaksa that the party would not yield the presidential nomination to anyone without a fight. Meanwhile, several UPFA MPs who are mulling whether or not to align with the SLPP in a future presidential election expressed concern at the manner in which their party and Mahinda Rajapaksa were defeated in January 2015 in a ferocious campaign to liberate the country from family bandyism.With all three potential candidates of the SLPP being brothers of former president Mahinda Rajapaksa, they are wary of being defeated at election in a campaign similar to that waged against them in 2015. Former Speaker Chamal Rajapaksa said that he would willingly consider if the party nominates him as the next Presidential Candidate. When questioned by the Daily News over media reports over his presidential ambitions, the former Speaker said that he was ready to contest if the people are ready. “When the media was posing various questions as to whether I am ready for the elections, I said ‘yes’. If the people are ready then I am ready too.That’s all,” he said. Former Speaker Rajapaksa was however skeptical whether he would be given the opportunity to contest. “Let’s see if the offer comes my way. It’s too early to comment,” he added. Asked whether he prefers to contest from the SLFP or the SLPP, the former Speaker said again that it has to be decided when the time comes. “When the time comes, the party will nominate a suitable candidate.There is nothing much to agitate over it,” he said. The former Speaker said that they were attempting to put forth one Presidential candidate jointly from the SLFP and the SLPP. Of the two brothers there is no doubt Gota, is the better one to get the country into good shape. It does not matter who becomes the President on condition that he takes an Oath not build a Dynasty and do his utmost to annihilate nepotism and corruption with a view to develop our country. A maximum term of two is adequate for a President. Future politicians must be professionals to govern our country with qualifications in the field of Constitution Law,Political Science,Accounting, Economics or a proven track record of his skills, in order to apprehend and assess proposals from other developed countries. They must also have negotiating skills and be fully conversant in English,Sinhala and Tamil. The Politicians should set a model to our country like Fiji Islands and adopt a low profile to alleviate, attachment, desire, greed, delusion among the general public.The present myth of procuring blessings from Astrologers and influential monks is a fake to the educated and a drawcard to the rural folk, with deference to Buddhism.